Father’s Day, 2014 was coming up. 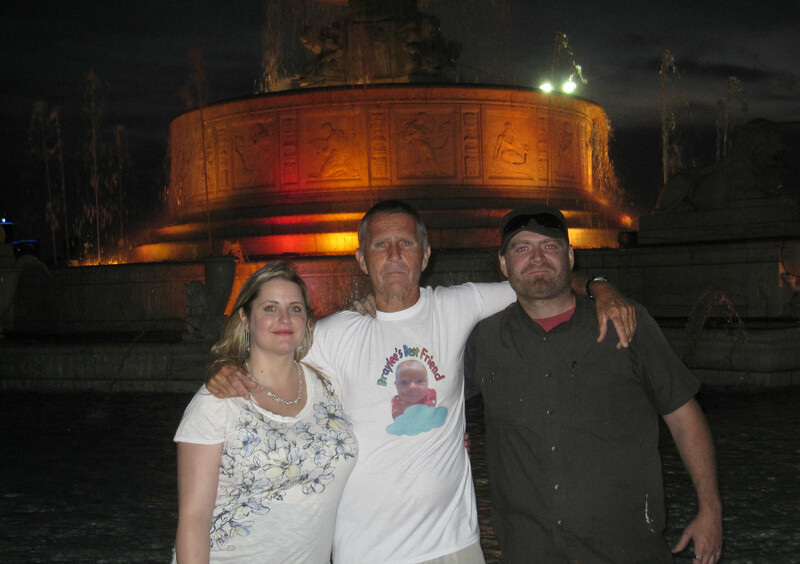 I was to be in Dearborn – Detroit, Michigan on that day. 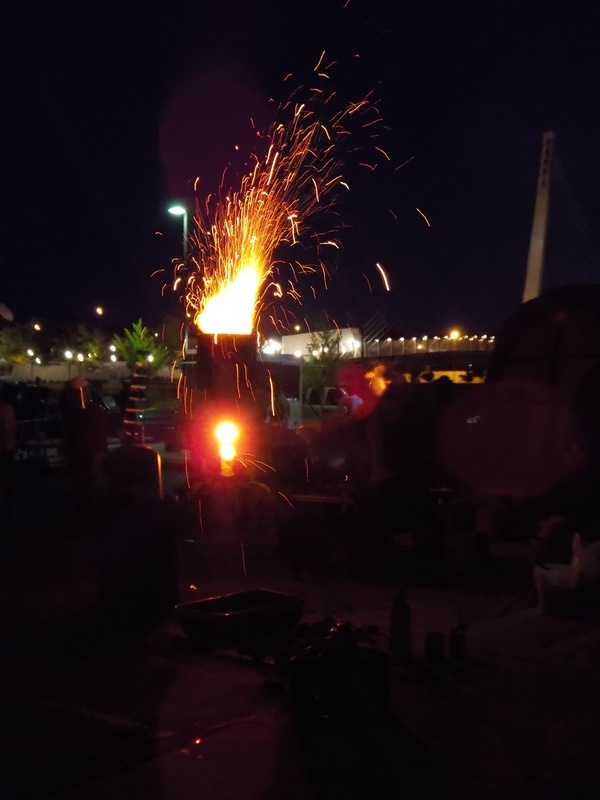 The family and I were driving up to see my youngest son, Casey, and a week-long workshop with an iron pour. 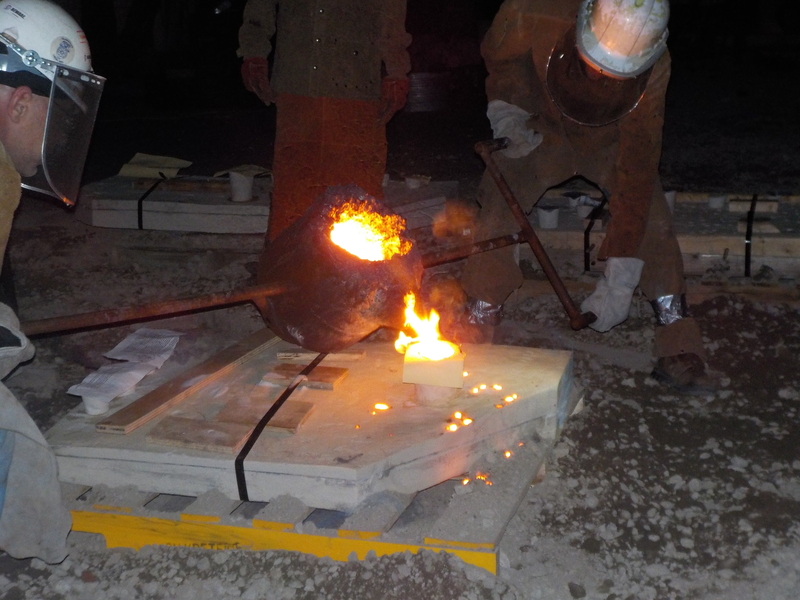 That’s just what it sounds like…melt some iron and pour the molten stuff into forms that have been made by artist and would be artists. This was all done at the 555 Art Studio in Detroit. We stayed in a motel in Dearborn on Michigan Highway, U.S. 12, which was created to make a direct connection between Detroit and Chicago. If I ran east and almost to the end of Michigan Avenue, I would just have to take a couple of turns and be at 555. So, it seemed that I could run there and not get lost (and possibly murdered.) It did turn out to be a good, safe run. I spent some time running in the mornings in both directions on Michigan Avenue. Going east was definitely a better run than running west. A little over two miles to the east was the discovery of the Rouge River Trail, a multi-use trail that meandered by the Henry Ford Estate. This trail was a jewel. I entered the trail on a slight descent that led to the Rouge River. I was struck by the sudden change in environment from the previous two miles. All of a sudden, I was in a forest secluded from all traffic noise. The trail eventually entered a population area as it skirted the University of Michigan at Dearborn. Still, I was on the edge of the green space and enjoying it. There were quite a number of walkers, cyclists, and some runners on the trail, but it wasn’t crowded. I ran the trail on the way to 555 on a Saturday morning. I would be at 555 all day for the workshop-ending iron pour. The Rouge River Trail ended at Hines Road at the trail’s two-mile mark. But, across Hines Road was another trail which, in reality, extended the Rouge River Trail to who knows where. The ending sign across the road had a mileage mark of 17.5 miles. So, I knew I would return the next morning and run my fourteen miles on these trails. The next morning had me continuing on the trails running through a very pleasant surrounding of park areas. 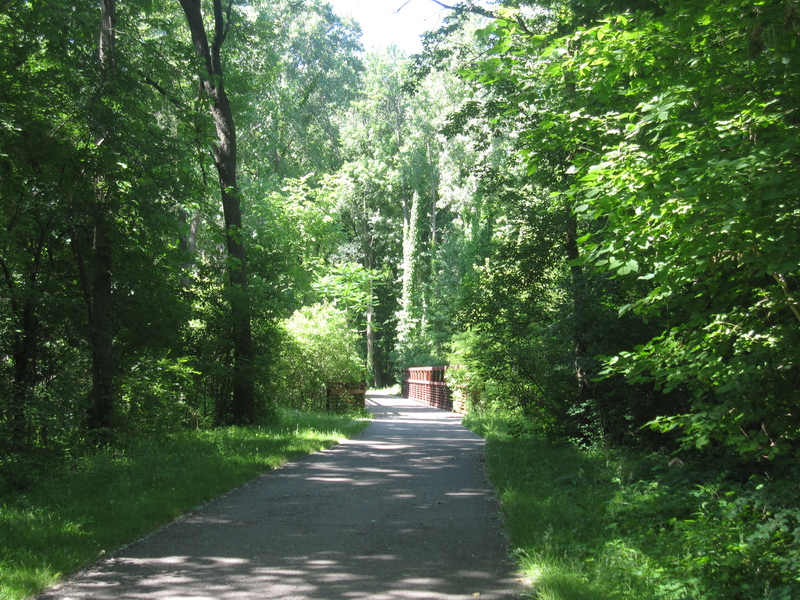 The trail ran adjacent to a few parks and eventually into a residential area. That was my turnaround point for my mileage. The only problem was the lack of water fountains. I found one fountain at a park building, but, as my luck would have it, it was out-of-order. The lack of water was not a big problem because of the weather. I had been running in the mid-Georgia and north Georgia in warmer temperatures than Michigan. And, the humidity was super low compared to Georgia. So, I felt cooled and almost completely dry as I ran. My mouth just got a little dry and water would have helped. But, I was OK. I was running in new areas and enjoying the exploration and the weather. I was seeing new things. In my running life, I have always thought that I was lucky to be able to see things in such a way, to be able to explore on foot, stopping to notice things one might miss speeding by on wheels. I almost felt sorry for those people trapped in their vehicles riding along in comfort. But, maybe I’m crazy…a little bit. Then, I thought back about seeing my son involved in his iron pour the previous evening. Now, admittedly, I don’t know a whole lot about his art stuff…just don’t understand some of it, but I do recognize one important and, maybe, the most important thing about it. And, that is his passion for what he is doing. He is totally involved in the process that took all this day for completion. He was totally absorbed. He was physically setting up the venue for the pour. He was mentally checking and double-checking every step of the process. He was planning several steps ahead in order to insure that everything was not only done but also done correctly. He answered a multitude of questions, some very abruptly and some with the diplomacy of a politician…whatever fit the situation and the person asking, and to get the results needed. He was multitasking to the extreme, everything was coming together. I was impressed by his energy, knowledge, skills, and social tactics. Nothing could be better than knowing your children will find something positive to become passionate about in their lifestyle. Art is that passion for Casey. I think nothing could be worse than to just drift through life without anything to value with intense passion. As previously mentioned, these thoughts came to me as I was enjoying my running and recognizing my passion in my running. My running is a fairly private affair, especially since 99% of it is done alone…the exceptions being races. My expressions, feelings ,and actions are almost completely unobservable, coming from the inside out. About the only one detecting this is me, the artist practicing his private art. Even with this difference in observation, Casey and I have something in common…passion. Sometimes, family members get perturbed about my running. I didn’t detect any of that during this trip (I probably just missed it)…perhaps, because father’s day was stuck in there. That made me realize how lucky I am in having a supportive family for all the running and some of the ultra races I do. Casey’s project made all this possible. So, thank you, Casey!! You make a father proud!